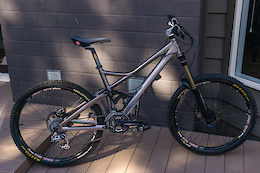 (new price) Knolly Endorphin size Medium. Very good condition 2017 Knolly Endorphin (130mm rear suspension) with Rockshox Monarch RT3 shock (3 position lever) and a 150mm Rockshox Pike fork. Fork stanchions and rear shock shaft are in perfect shape with no scratches. Reason selling is I am getting another one. Bike has never been shuttled, chair-lift ridden or taken to a bike park. I am just an old guy that trail rides. Frame is a size Medium. The steer tube has lots of adjustment if you wanted to raise or lower the stem to your preference. Check out all the details and what makes these bikes ride so special. https://www.knollybikes.com/endorphin Frame and all parts are straight from Knolly. This is what they call their "VP build kit". Both brakes and the dropper post have just recieved a fresh bleed as well as a new bottom bracket installed since I had a spare. Both tires are set up tubeless with new sealant. 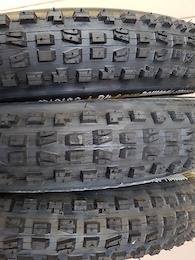 As a bonus, I am including 2 almost new (5 rides) Maxxis Minion tires. 2.5 Maxxis Minion DHF and a 2.4 Maxxis Minion DHR . The bike has Knolly's custom black titanium pivot hardward all round, and all the main pivots run on dual row angular contact bearings with oversized CNC'd axles. Dropper lever and rear shifter both on Sram Matchmaker attachments, so there are only two clamps on the bars for everything. Fork: Rockshox Pike 150mm travel. Rear Shock: Rockshox Monarch RT3. Headset: Cane Creek 40, Zero stack. Stem: Chromag Hi Fi 35 (50mm) Bar: Chromag OXS 35 Grips: ODI Rogue. Brakes: Sram Guide R Shifter: SRAM GX 11speed trigger. Seat Post: Rockshox Reverb - 150mm dropper. Post Collar: Chromag NQR - black. 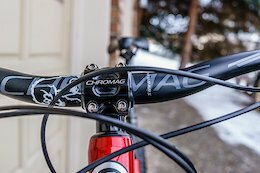 Saddle: Chromag Lynx DT - black. Crankset: Sram GX Rear Derailleur: SRAM GX 11speed. Cassette: SRAM XG 1150 - 10-42 tooth. Chain: SRAM PCX1 w/powerlink Wheelset: Sram Rail 40 with blade spokes. Front tire: Maxxis Minion DHF 2.3 - F60 3C/EXO/TR (Tubeless) in great shape. Rear tire: Maxxis Minion DHF 2.3 - F60 DC/EXO/TR (Tubeless) in great shape. Pedals: none included. The bike is in amazing shape, there are a few paint chips on the frame, but nothing out of the normal. 9 inch rotor, with bolts, 6 hole mount, comes with fox40 adapter but pretty easy via spacers to adapter to any fork or even rear if frame can accommodate. Was pro only prototype and never used. Brand new never used. It's a great fast rolling rear tire but with cornering side knobs when you need them. Not tubeless ready and foldable beads. Price is per bag. or $30 for all four bags. Smith roll off I.R.F. film packs. 12 rolls per bag. Check your goggle to see if they fit, sometimes fit other brands of goggles too. Price for both sets. Brand new still in packaging. Use code on packaging to determine if they fit your brakes.